Scuba diving in Aruba can be an amazing and memorable experience for the novice diver all the way up to the advanced diver. Aruba scuba diving offers you the opportunity to see some of the Caribbean’s most famous shipwrecks, beautiful reefs with amazing coral shapes and colors, and a plethora of exotic marine life. Sting rays, Moray eels, Angelfish, Parrot fish, Clown fish, Yellowtail snappers, Manta rays, Barracuda, lobster, sea turtles, sea urchins and much more, including the elusive seahorse can be found in the waters of Aruba. Scuba diving in Aruba will also expose you to reefs with the most beautiful and interesting coral formations in stunning colors. Most of the scuba diving in Aruba will be done at a variety of dive sites on the western and southern coasts of the island. Although there is the California Wreck diving site on the north coast, it is for advanced divers only due to the strong currents. Scuba diving in Aruba offers you an amazing experience to see and photograph unique wrecks, stunning coral formations and fascinating marine life. 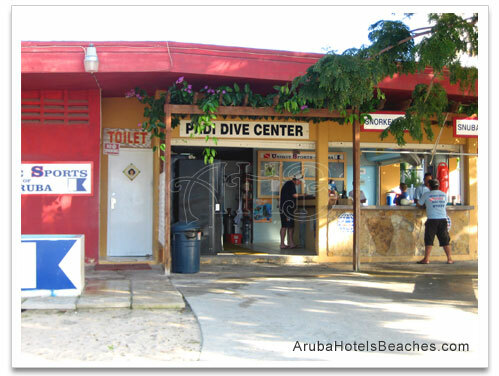 Here is a list of the best Aruba diving areas. The WW 11 German Freighter Antilla wreck is the largest and one of the best wrecks in the Caribbean. It is approximately 400 feet long and is considered a great dive site for both snorkelers and scuba divers. Good for both day and night diving. This is definitely a dive to be logged. The Pedernales wreck was an oil tanker that was damaged by a torpedo attack from a German U-boat in 1942. It was divided into three sections. The bow and stern were salvaged by the US military. The middle section remains in the waters of Aruba and is a popular dive site. This wreck is good for beginner divers. The Jane Sea wreck is a smaller Venezuela cement freighter that was sunk in 1988. There is a popular story that says the ship was sunk after the authorities found cocaine on board. It is about 250 feet long and is one of the most spectacular wrecks in Aruba. This dive is probably best for advanced divers. Good for day and nighttime dives. The Debbie 11 wreck is a 120 feet long fuel barge that was intentionally sunk in 1992 to create a new dive site. This site offers good photo opportunities. The Star Garret wreck is a 300 feet long cargo shipwreck with plenty of marine life that makes for an exciting dive. The Tugboat wreck starts at 20 feet and goes to 70 feet. Here is where you will see Moray eels, stingrays and octopuses. The Airplane wrecks in the waters of Aruba were done intentionally. The sinking of a DC-3 and a YS-11 airplane were done to create an artificial reef to give Aruba scuba divers a unique diving experience with great photo opportunities. Many of these diving operators give courses for beginners and all the way up to Dive Master Certification.There are various scuba diving packages with most including hotel pick-up and drop off. Shop around for price and convenience. Don’t forget to look for discount coupons. If you have never been scuba diving before and have an urge to try it, Aruba is the perfect place to get certified. There are diving operators along the beaches and in some of the resorts. Ask for information at your resort’s Activities desk or at the resort’s Concierge desk. If you are still unsure about scuba diving in Aruba why not think about snorkeling in Aruba! Copyright ©  ArubaHotelsBeaches.com. All Rights Reserved. It’s Free! Don’t miss out! It will include Special Sales and Prizes offered to AHB Newsletter subscribers only! I promise to use it only to send you ArubaHotelsBeaches E-Zine. Turn your hobby or passion into a successful income earning website. Click below and learn how to get started building your own online business!